I so respect and admire the true plant lovers, who nurture cactus in the Yukon or bananas in Alaska: indoors, with bottom heat, full-spectrum lights, de-humidifiers, miticides, and so on. These are people with real skill and love for growing things. All I have is the right climate. Here, the more Echeverias, the better. I remove the leaves from the flowering stems (they flower here) and lay them on a dish of cactus soil mix--the plain old packaged kind, not the special hand made mixes that real plant lovers make and experiment with and perfect for their own conditions over the course of decades. In a few weeks, new baby Echeverias. They're like people--adorable as babies. Unlike most people, they're adorable when they grow up, too. 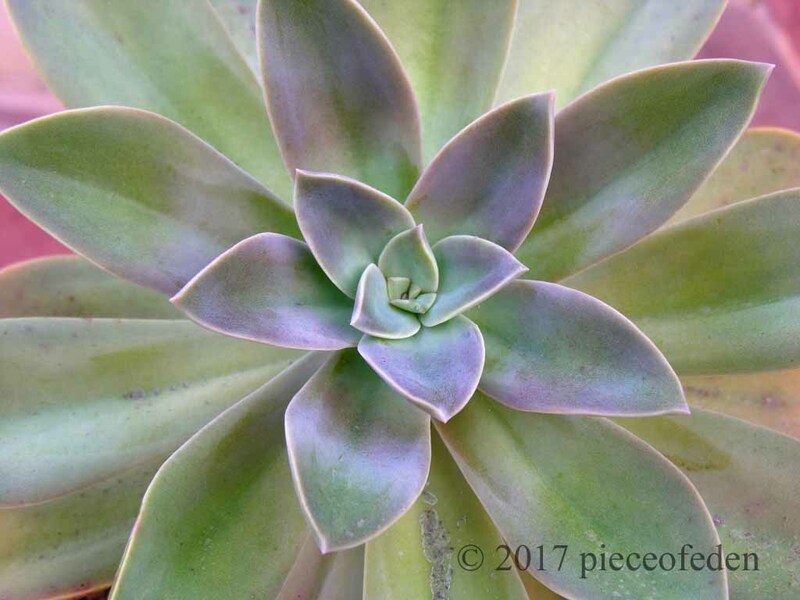 Keep in mind that baby Echeverias need more water and considerable shade--they are not as tough as well-established plants. 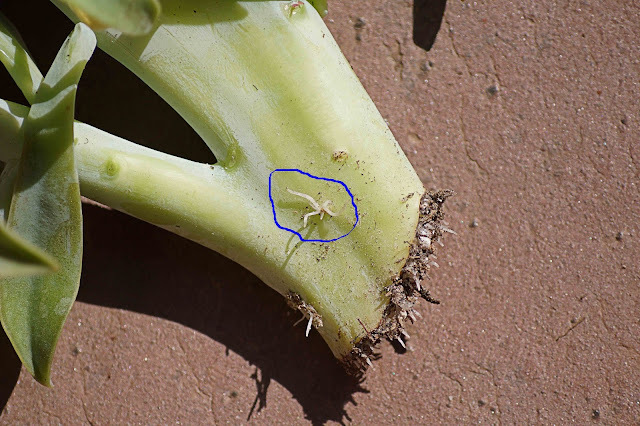 Besides propagation from leaves, if the main stem of the Echeveria becomes long and bare, you can cut the rosette off, let the wound dry for a week or so, and reroot the rosette. An expert recommends suspending the rosette just barely out of reach of a layer of growing mix. The rim of the pot can act as support. The rosette will send roots reaching down towards the mix. When you see a good amount of roots, it's ready to plant in the soil. 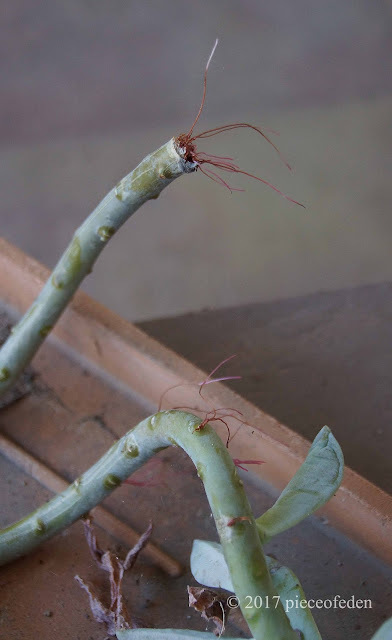 When beheading an Echeveria for re-rooting of the rosette, if the old bare stem is in good health, you need not discard it. It is possible it may sprout brand new baby rosettes! These too can be cut off and rooted. Echeverias--the more, the better! Why? So you can make tapestries out of them. Here's a page with Echeveria tapestries. I don't have any of my own yet, but now you understand why I'm propagating so many. Here's a post on a spectacular Succulent Tapestry. Some other good design tips for succulents here. Another post on Echeveria propagation here. I cut the stem and placed it in a pot of dry gritty mix, and the pot went into bright shade with no direct sunlight. Five days later, roots! Note the circled area in the photo. That bit of emerging root sprouted from where a leaf had been. I pulled some of the leaves off to expose more stem. Now that it has roots, I'll water it just once, and wait a bit--a couple of weeks, perhaps, to give it time to grow more roots. Then I'll start watering it regularly, once every one or two weeks. For easy growing, I recommend starting with Echeveria 'Imbricata', which is thought to be a natural hybrid, and Graptoveria 'Fred Ives', a hybrid of a Graptopetalum and an Echeveria. Both are vigorous and not as fussy as some of the species Echeverias. 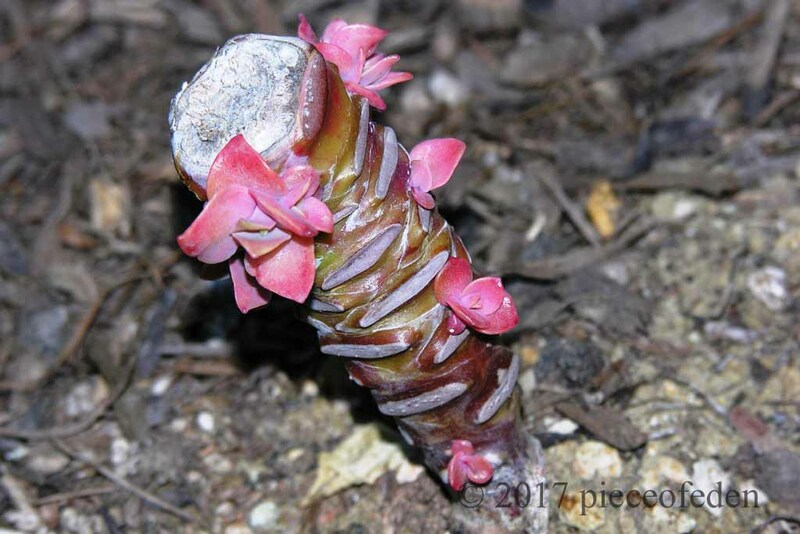 Found this through a google search for "echeveria babies"! I didn't know what to call the small growth I have coming out of the side of a large echeveria. 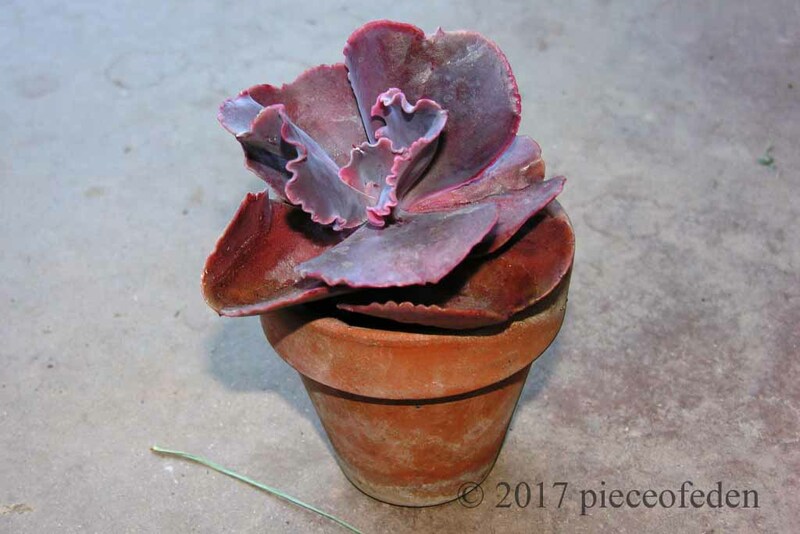 Happy to have found your blog through my search for echeveria propagation. I have a few leaves lying on top of soil, and it's useful to know that it might take a few months for their little root-babies to form. Thanks for the great photos, too! I wasn't sure if I COULD propagate them from leaves. I'm glad to know it's fairly simple! I will take the slightly-withered babies I've got and start some new plants. I don't have the right climate (well, not in the winter, cold dessert) but I am still hooked on these awesome plants! Oh my what a great blog post! Super information for beginning succulent growers and even for those that just don't know how to propogate! 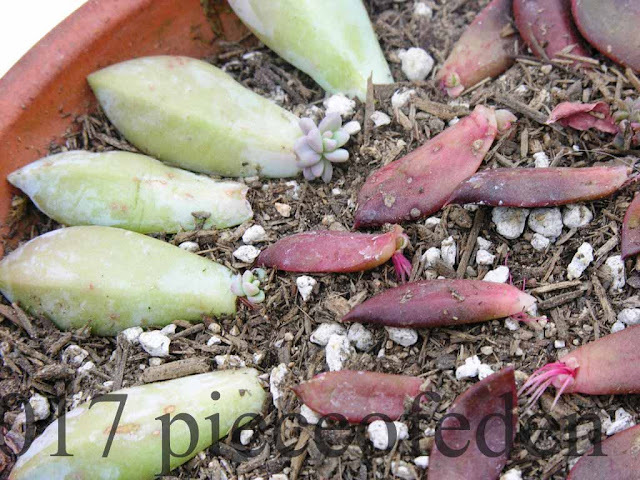 I went outside in my garage today and found some some graptosedum that had fallen off the plant onto the garage floor. And they had baby plants on them! Laid them on some soil and off they will go! I am one of the crazy people that grow these plants indoors during winter, in Minnesota! It's not as hard as is sounds. I keep my succulents in a south facing window and hardly water all winter. As for the bananas, they also do great near a south facing window with little care. :-) Lucky you to live in such a warm climate, I am envious! Kudos! My first year with succulents and I am growing them inside already (Washington State) . This includes new staghorn, and other ferns, and I am very excited to be with these plants. I feel there lives fill my need to "look after" someone! @Candy, happy to be of use. Hope it helps. Love your post. I discovered quite by accident that succulents were so easy to propogate when a dog trompled down one leaving broken leaves all over the bed. It was late fall and the next spring...many little plants came up! I've been sharing them ever since. Hi, I have an echevaria that has two main stems that are really long (up to 6", both stems) and the rosette at the top (I took out the bottom leaves to try and propagate them). Is it possible to take bare stems (say I take off the rosette off the top of both, and then take out a part of the super long stems to leave a smaller 'stump') and propagate those? Thanks! It may be possible, yes. You could try laying a piece of stem on soil and see what happens. HOWEVER, think about this: a stem with existing roots trying to produce new rosettes, or a stem without roots trying to produce new rosettes. Won't the rooted stems have an easier time? You could also see how the stems do. If they produce new rosettes near the top, you could cut that part off, and see if the remaining stem also produces new rosettes, thereby shortening your stems gradually rather than all at once. Hope that helps. Good luck with your plant! what kind of echeveria is that last one? lookin' all crazy..
That might be the hybrid 'Etna'. The bubbly texture is called carunculation and can vanish during drought as the plant uses up the moisture stored in its foliage. Hi, I have got a huge collection of succulents, especially echeveria. I got a recent new addition, which sadly died quite quickly, I think they over watered it at the store, before I brought it home, wasn't quite sure what it actually was. It was like a dark green version of your first picture. I have a echeveria glauca and duchess of Nuremberg which are doing fine so far, still small. The one which died/withered/rotted away had an offshoot (not sure my terminology - it's grown off from the main plant.) 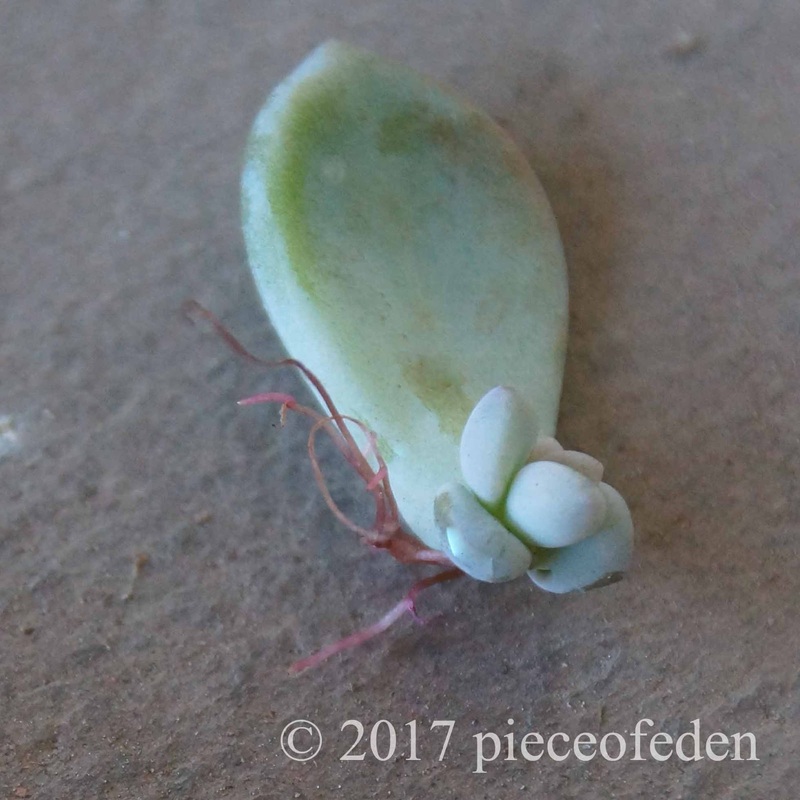 I heard you could propagate more plants from cuttings, so, this offshoot dropped off, and I left it to callus over, because it had some roots. left it for a while, and a lil rosette has grown, at the top of the offshoot, not by the roots or base like in your pictures. is that still normal ? should I separate the rosette and plant it, or leave it to get abit bigger ? it's still no bigger than 1cm. Hi! If your little offset is only 1 cm, don't touch it, just let it grow. Any growth you might get is good. Watch for mealybugs and spider mites. A LIGHT misting of water if it looks dry. Depending on your climate, a mix of pumice and coarse sand or grit with just a bit of peat (less than 10%) can be a good mix, but if your climate is damp be very careful not to over water. They are quite happy with damp but not with wet mix. Good luck! Hello, We have this plant at home (Echeverias), but not knowing we take care of it right, live in Brazil. Hello, I love this blog and your website. A couple questions, if I may. When propagating Echeveria, can you only get results using the leaves from the flowering stem and not from the branches? Also, when you lay the leaves on top of the dirt should the dirt be dry or moist? Thanks for your help. Any leaves in good condition will work--stem or branch or rosette. As to moisture--until you see roots, moisture is unnecessary. Shade (bright shade, not a closet) is more important--because if the leaves are in full hot sun they will dry out before they have a chance to grow roots. Hope that helps. Great information! 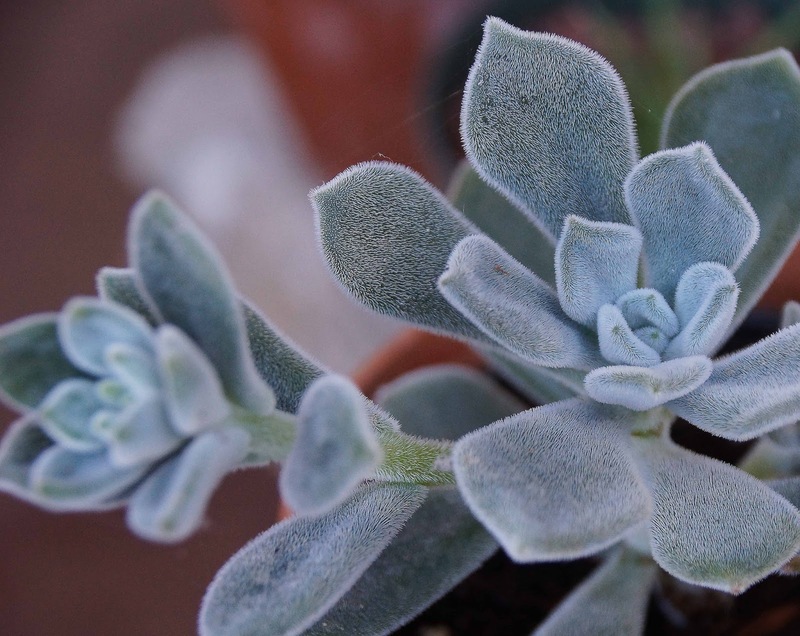 Hoping this is an easy question ( though I've googled for details and can't find them) I have a blue rose echeveria I finally bought and planted yesterday in my garden...yesterday. I live in California and we are expecting 100 degrees today/this week. Trying to do my homework to care and propagate these. Plant already has offset rosettes growing, would like to separate them and spread through garden. Lots of websites use the word, twist off or cut. Does it matter? Is there a better time of day or year to do this? How big should I let the " chick" get? Do I need to let it dry some before planting? Thanks a million. I just cut with secateurs. Echeveria 'Imbricata' aka Blue Rose is the easiest Echeveria so you chose well. It is easiest to get started in mild temperatures. Leave the rosette to dry a day or two in full shade before putting it into soil. The larger the offset, the greater the chance of successful rooting. At least an inch in diameter is a good size. 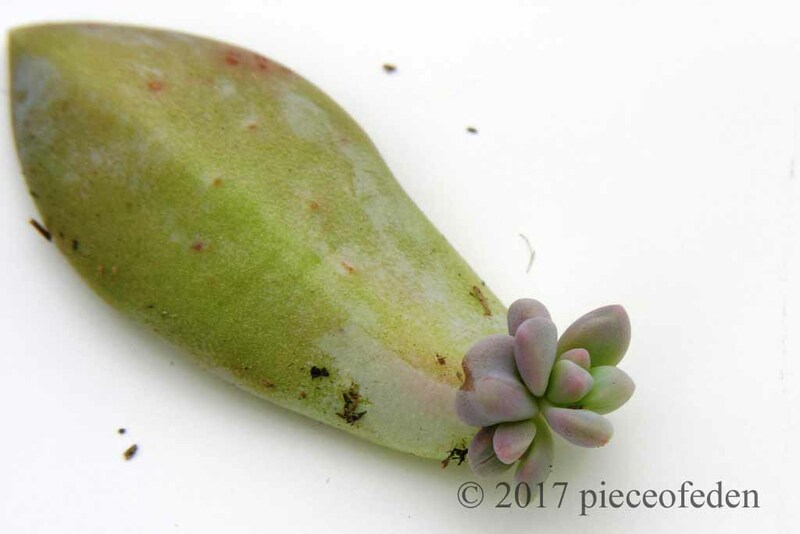 Is it possible to propagate Echeveria 'Imbricata' from leaves? 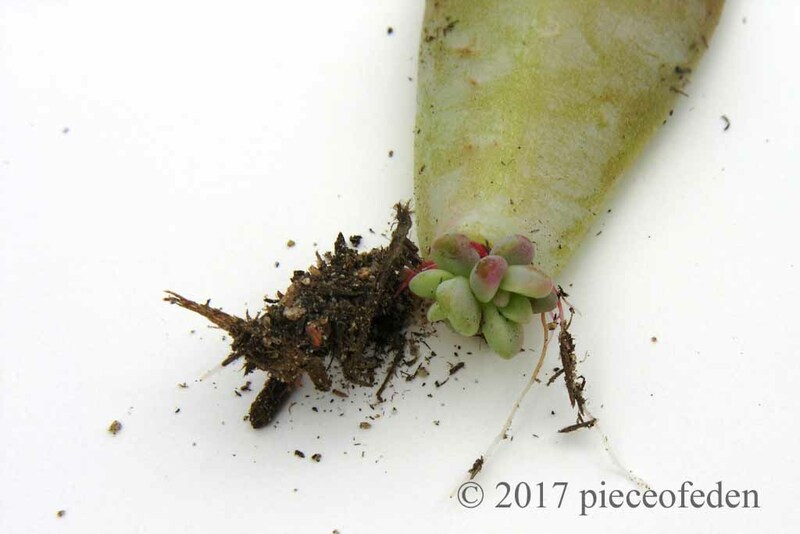 Yes, it is easy to propagate Echeveria 'Imbricata' from leaves. Oh, I know someone who will find this interesting. Sharing! Great post! I was trying to decide what to do with a leggy Echeveria. Now I know to cut the top and suspend it so it will not rot. It's very deep, dark green and I cannot find another like it in searching. Thanks, Shirley. Hope your special Echeveria is soon renewed and perfect again. any tips for controlling mealy bugs on succulents? I live on an ancient coastal dune complex, so billions of ants. No controlling them alas. I have the same problem here with ants, who "farm" the mealies and aphids. Any ant control you can do will help, but for mealies regular inspections and keeping a spray bottle of alcohol handy. Spray with isopropyl ("rubbing") alcohol as soon as seen and repeat to catch the eggs. The alcohol kills then evaporates, so it has no negative effect on the plants. I use it straight but some people prefer 50% alcohol / 50% water. Vodka works also, in a pinch. How do I "cut" a big "baby" growth off of my current plant? I don't want to damage it and want to do it right, so the "baby" will live. I can send a picture if needed. How big is the "baby"? Can you reach the stem of the "baby"? If you can, you can cut off the stem with clean, sharp knife. Be very careful not to hurt yourself, or the original plant. If there is not much of a stem, let the "baby" grow for a while and try again. 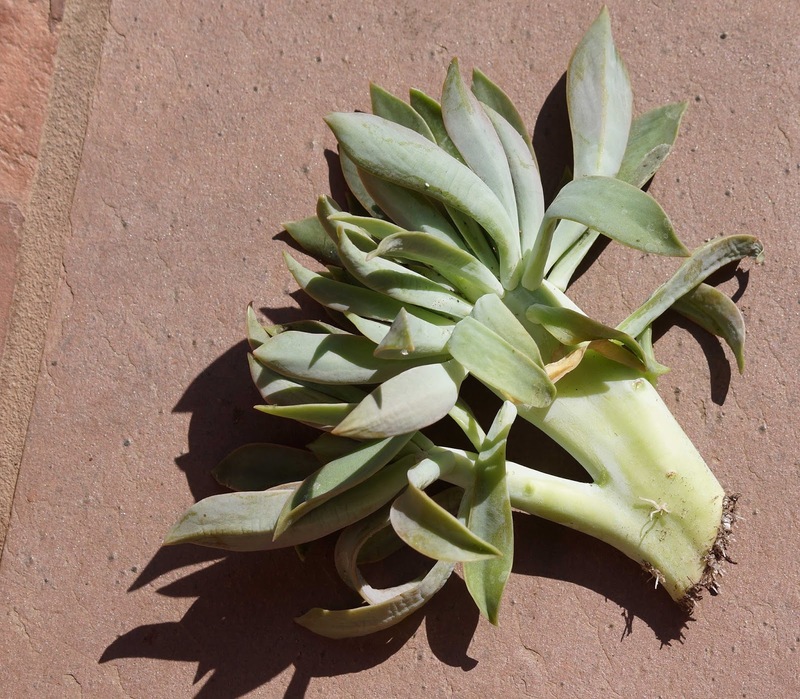 Once cut, let the cut place on the stem dry out for a few days, then plant in dry cactus mix. Leave the cutting in bright indirect light. Check for roots forming about once each week. When you see some roots, you can start watering. Do not over water. Gradually, slowly, introduce the new plant to more light once it has a good root system. They don't really need to be propagated, you can leave the plant alone and enjoy it as it is. Plants must put effort and energy into producing a flower stem, so it's not unusual to see a little stress. The plant can recover. I recently acquired (sneakily broke off) a leaf from a plant I have never seen before. It looks like an Echeveria bodybuilder on steroids. It is so huge that one leaf is larger than my hand. I am letting it callous in preparation for starting it. Have you any idea what kind it might be? Hello there. Love the post on Ghost plants. I read other posts about just keeping them in a south facing window but what I want to know, is it a problem if the windows are special "UV filter" glass? I have several Kalanchoe Blossfeldiana, a new Christmas Cactus I grew from cuttings, 2 jade plants, 3 crown of thorns (mostly cuttings) and the aforementioned Ghost Plant cuttings. By looking at your blog, your plants seem well-cared for and healthy, so you obviously know what you are doing. From what I have read visible light is sufficient for plants, so UV filter glass should not be a problem. However I'm no expert in indoor growing. As to grow lights, with most tender succulents such as Graptopetalum, as much bright indirect light (isn't that what grow lights mimic?) as they can get makes them happy. My Graptos rarely bloom because I keep them in mostly shade and water them very little. They are spring bloomers here, not winter. Thank you so much for the help! :) I'm really hoping to get my Kals to bloom this year so I'm going to try a box and the 1 south window in my house that no one will miss. (hehe, she read my blog and thinks my plants are well cared for... HA!) You should read some of the earlier posts about aphid treatment gone awry. I lost 4 out of 6 of my first Kals from too much treatment and I think my last 2 adults are gonna give up the ghosts too. :'( and before you ask, they're too badly damaged from what happened to make cuttings. Trust me, I tried several times already. They rot within a week in dirt after the 3 day callus period even with no water. P.S. what about plain old house lights like 40 or 60 watt bulbs for House plants? Too dim, not enough UV? Any experience with plain old house lights? Incandescent bulbs are not recommended for plants, because the heat they produce damages the plant tissue. So much useful information, I love echeveria and will use the tips to try increasing the few plants I have. Thanks. Have fun with them! They are wonderful little plants. I found some E. leaves which had fallen off a plant and were laying on a window still probably for a month. They were fully rooted out. tough plants under the right conditions.